As a celebration for good results, working hard, getting everything done days before I needed to, and because of a general need for a new pair of jeans, I went shopping today. I don’t go shopping that often, especially when considering I live within walking distance of a few shopping centres and a LOT of shops in Liverpool city centre/L1. I LOVE this shirt! There are a billion Star Wars shirts out there, but something about this one made it a must buy. Which is odd, considering I tend to avoid anything featuring the ‘bad guys’ and would rather have a hero proudly adorned on my chest! But the vintage looking shot of Vader looks amazing in the logo! I wanted my own set of the DVDs, so I can watch the films easily whenever I want, as they’re nowhere online to (legally) stream. This is a pretty bare bones boxset, I would have liked something more substantial, but this seems to be the most affordable option. I would have rather bought each of the three films individually, but the latter two individually cost more than this entire boxset. 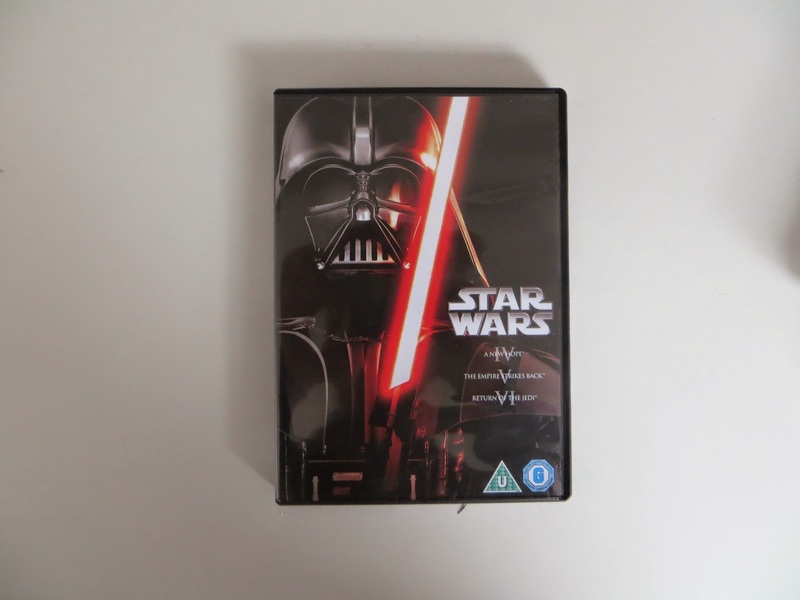 There’s another original trilogy boxset, however that costs double what this one does! There’s also the recent bluray boxset of the entire series, but I wanted DVD copies so I can watch them through my laptop. Plus I don’t really care about watching the prequels again anytime soon. This is my absolute favourite purchase of the day. I love collectables and little things like this. My desk is covered in Pokemon, Indiana Jones, Nintendo, Game of Thrones + other series memorabilia, and now Star Wars too!! Plus they come in this amazing diorama box, which has the Millenium Falcon at the back! This is an obvious recreation of one of the last scenes of the film, the getaway after rescuing Leia, with the fight between Obi-wan and Darth Vader in the background. I debated heavily whether to unbox them or not, but I ended up taking them out after I took these pictures. Mainly because I realised that I have no where to display them in the box! Though I have kept the box, incase I do make some room or change my mind. There’s also sets for Empire and Jedi, which I know I am going to invest in at some point, I mean, who can resist Boba Fett and Jabba the Hutt?! That’s everything! I don’t think I’ll be spending so much in such a short time for quite a while now. Though it was extremely fun to do that, and now I get to watch the trilogy! After posting this, I’m going to stick A New Hope on!